Baseball's history in Jasper began in 1868, and several teams were established during the 1870's and 1880's. 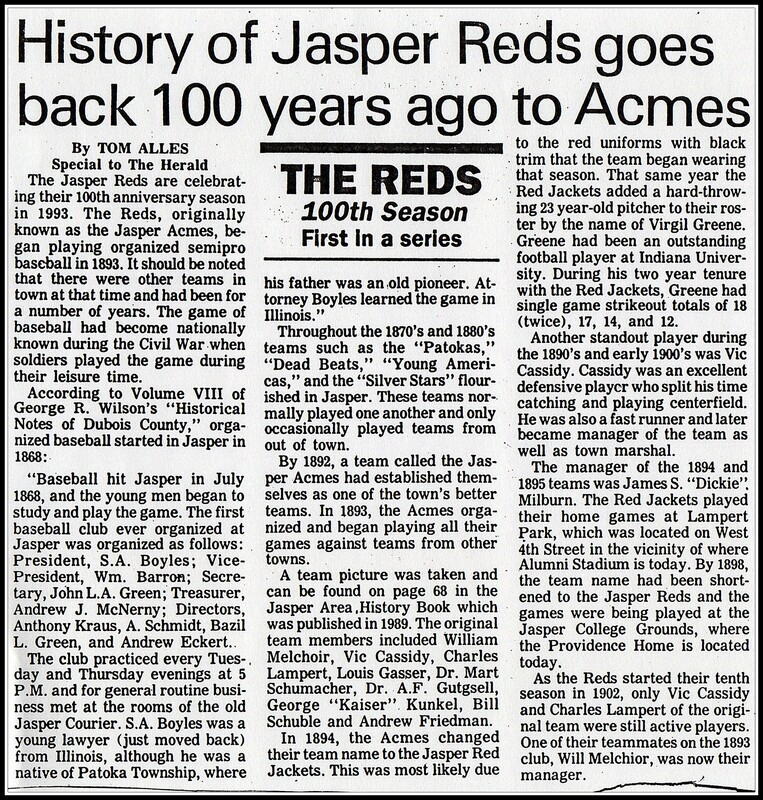 In 1893 the Jasper Acmes organized and begain playing against teams from other towns. The team was re-named the Jasper Red Jackets and later shortened to the Jasper Reds. The team,which has experienced ups and downs, celebrated it's 100th anniversary in 1993, and are still playing today. 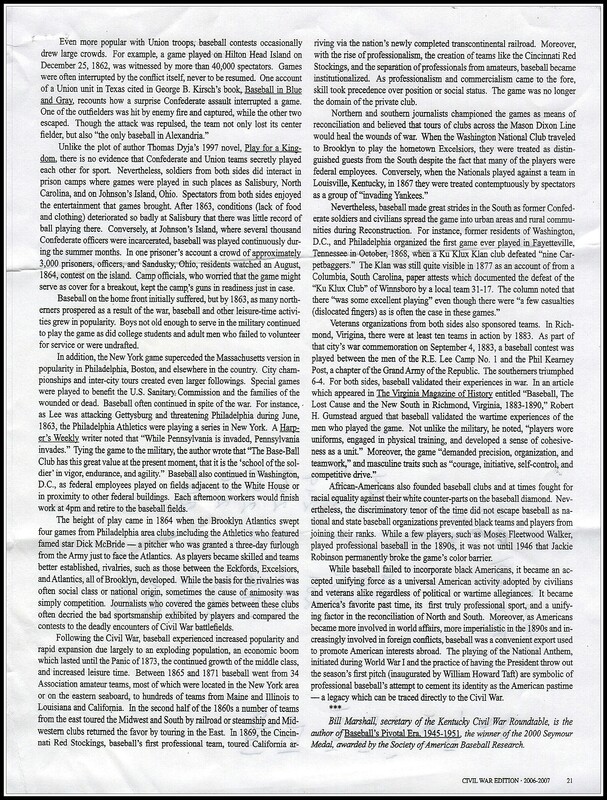 The team was featured in "Baseball Play America" published 1999, by Don Weiskopf and Play America Press. Bob Alles is the current business manager and brother Bob Alles is field manager. The Reds home is Ruxer Field, located off West 10th Street in Jasper. 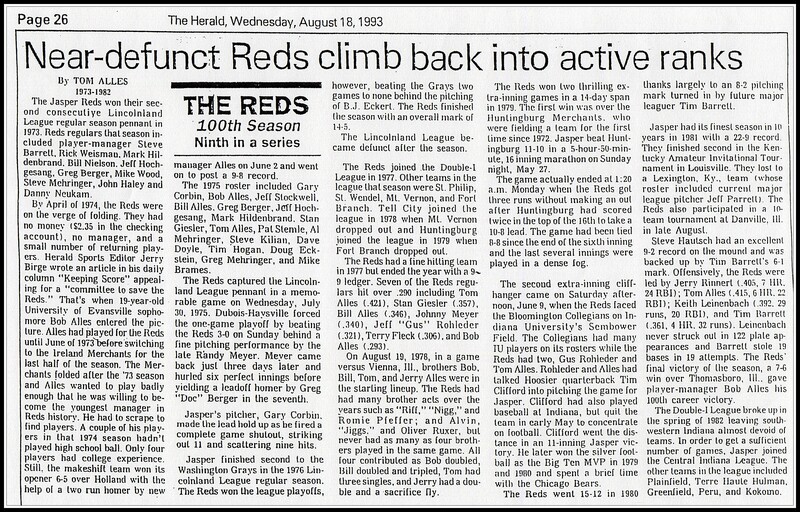 The Reds' annual reunion will be held July 18th at the Jasper Jaycee's Clubhouse in Armory Park. Anyone is welcome to attend. 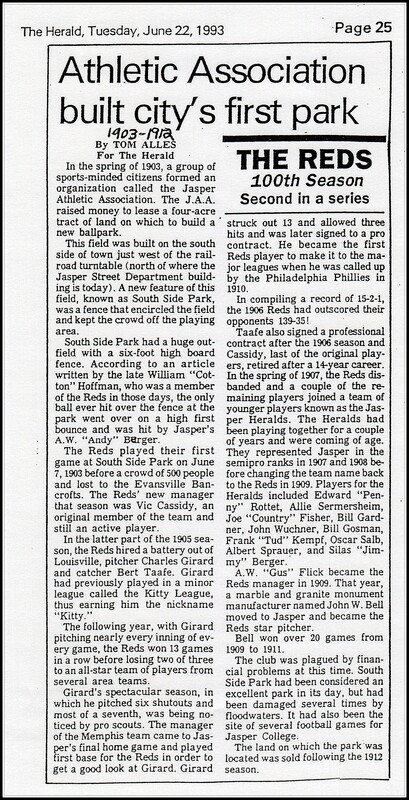 For information on the Reds' schedule and annual reunion, plcase contact Bob Alles (812-630-1623). 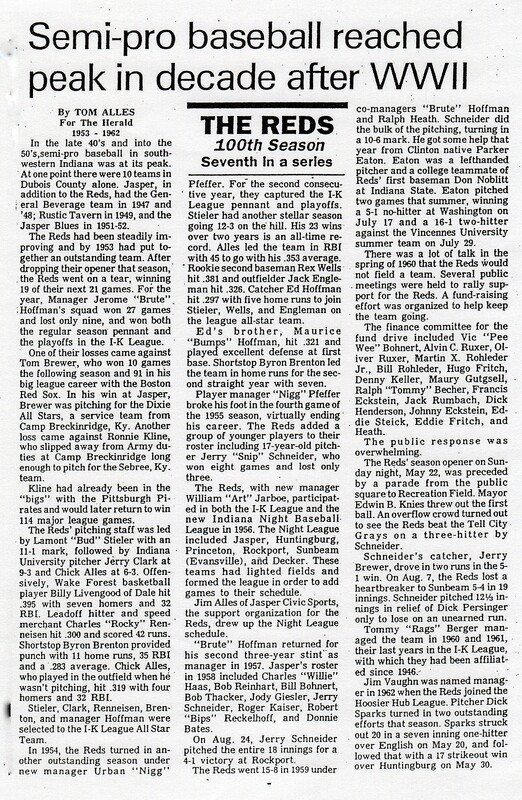 The following taken from "Baseball Play America"
100th Anniversary of Jasper Reds Since 1893, there has been a semi-professional baseball team in Jasper, Indiana, the oldest continuing non-pro organization in the United States. Originally known as the Jasper Acmes, the team had reorganized and began playing all their games against teams from other towns. 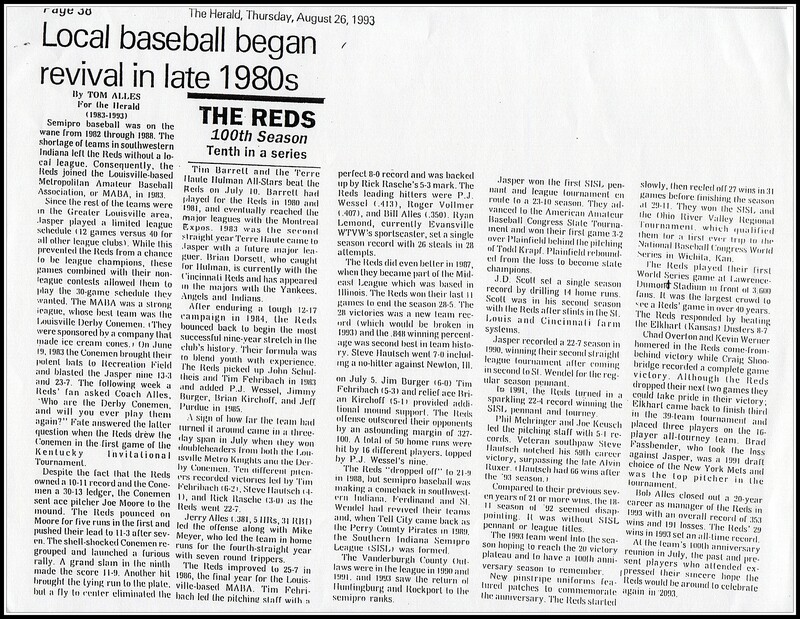 When the Reds celebrated their 100th Anniversary in 1993, Hak Haskins of The Herald, wrote, "With such strong tradition, the team has never let the community forget they were still around." The Reds, like many other hometown teams in America, represent not only the spirit and tradition of the city but semi-pro baseball as well. The team symbolizes what the town and people are all about. Players keep coming back, season after season, to keep alive the tradition and play the game they love. During the past century, the city of Jasper has produced many outstanding players for the pro ranks, most recently the talented Scott Rolen, third baseman of the Philadelphia Phillies. 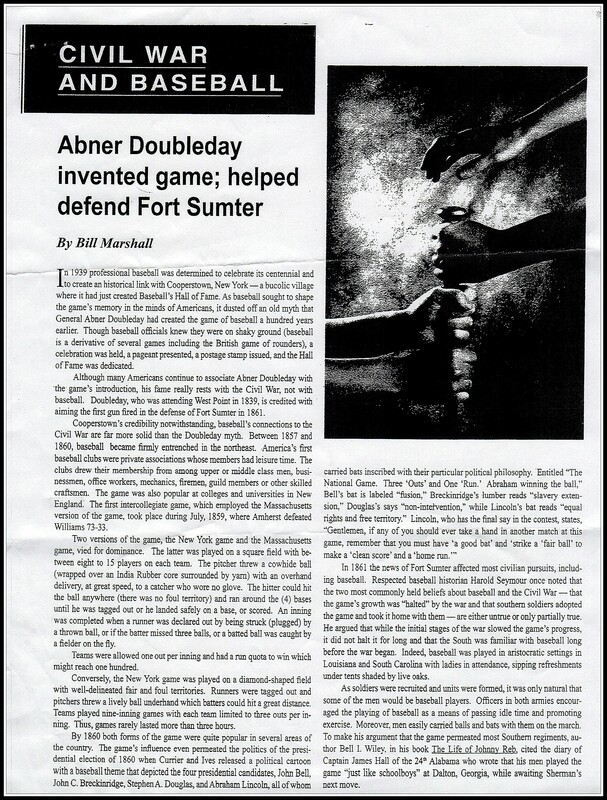 Organized baseball started in Jasper in 1868, soon after the end of the Civil War. Throughout the 1870s and '80s, teams flourished in Jasper," wrote Tom Alles in one of his 10 articles celebrating Jasper's anniversary. "The Golden Years in Jasper could have been the late '30s and early '40s when talent was more bountiful than broken bats." In 1940, the three Pfeffer brothers, Urban, 'Riff, and Roman, had much to do with Jasper's success. During World War II, major league pitcher Van Lingle Mungo, who was stationed at Fort Knox, Kentucky, pitched two games for the Reds. In the late 40s and into the 50s, semi-pro ball was at its peak in southwestern Indiana. At one point, there were 10 teams in Dubois County alone. Crowds of more than 1,000 spectators were common. However, in the early 1960s, interest in the Reds began to diminish. 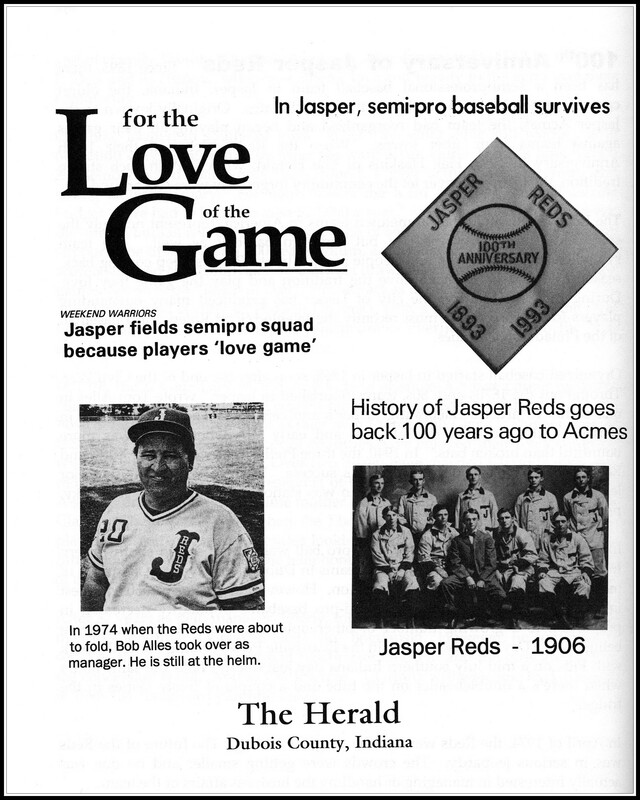 Semi-pro baseball's popularity decreased in proportion to a growing number of other options one-time Jasper fans were being given. David Jackson wrote in the Evansville Press, "Going out to the park with kids on a mid-July southern Indiana day just doesn't hold the same allure when there's a doubleheader on the tube and a couple of frosty tasties in the fridge." 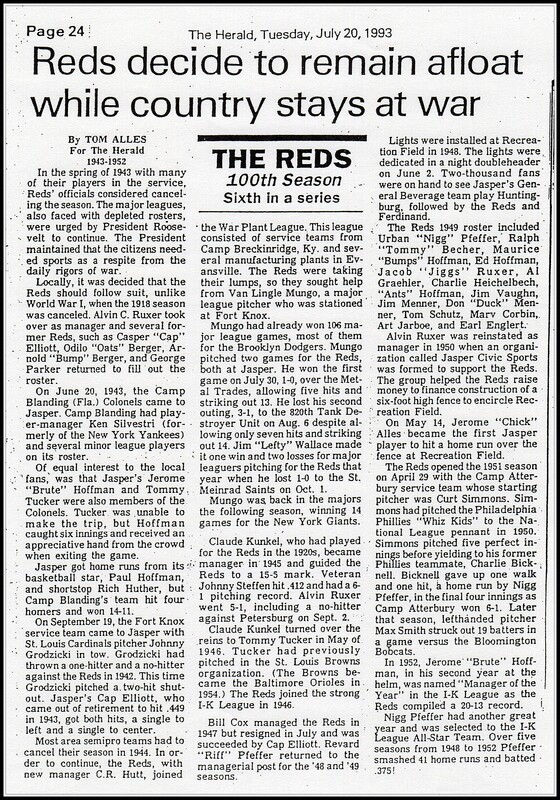 In April of 1974, the Reds were on the verge of folding. The future of the Reds was in serious jeopardy. The crowds were getting smaller and no one was actually interested in managing or handling the business affairs of the team. They had no money, no manager and only a few returning players. 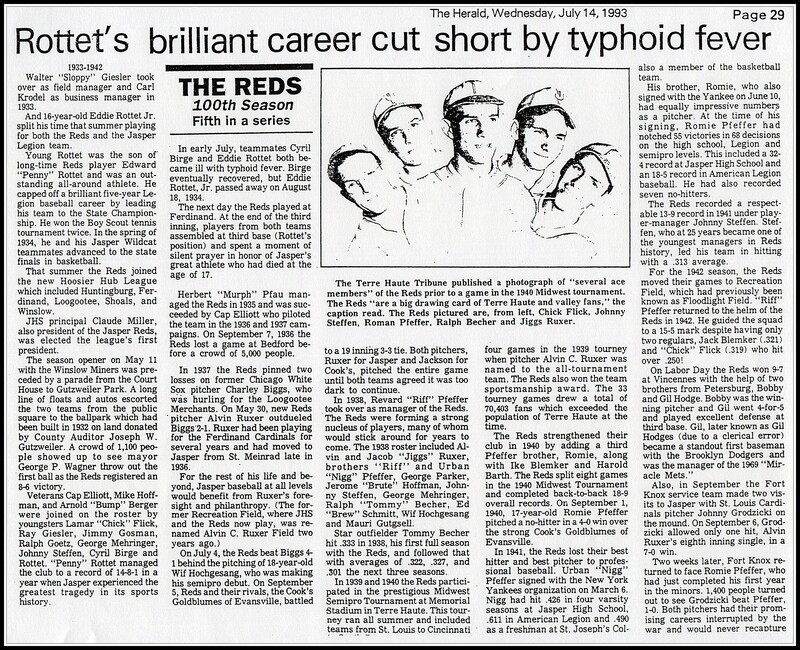 Jerry Birge, sports editor of the Herald, wrote an article appealing for a "Committee to Save the Reds." That's when Bob Alles, a 19-year-old University of Evansville sophomore, entered the picture. A former player for the Reds, Alles agreed to take on the mission of saving a team in which his father and three brothers had played for and his father-in-law had managed. 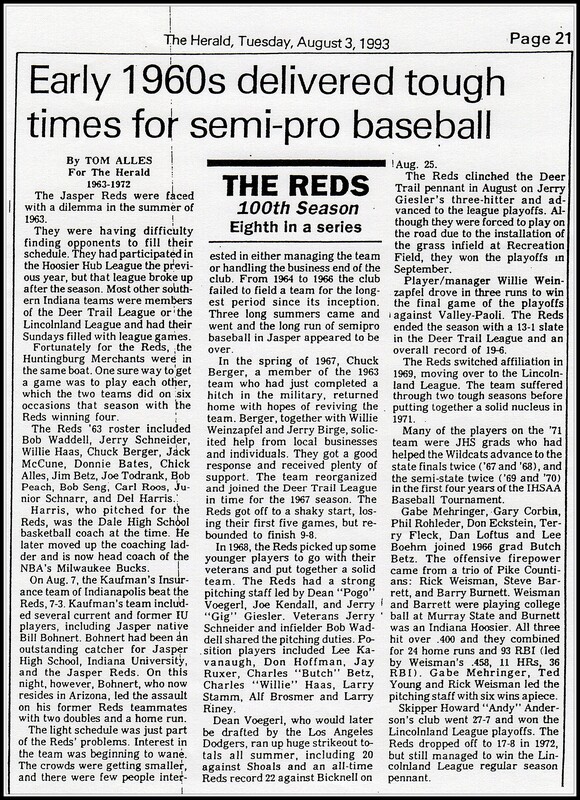 For the next twenty years, Alles managed the Reds team to an impressive 353-191 record, highlighted by the team's best season ever, a 29-10 mark, the year Jasper celebrated its 100th anniversary. Players wore patches that proclaimed the extraordinary achievement. This banner season for the Reds was capped with an unprecedented trip to the NBC World Series. Playing in Wichita on artificial turf and with crowds of 2,000 a game was a story book finish to Jasper's century-long anniversary. Following the 1993 season, however, Alles decided to relinquish his managerial duties, but not for long. Still handling the Reds' business affairs, Alles, a popular high school teacher, returned as field manager in 1996, at age 43, and now has collected over 400 victories in 24 years, everyone for his beloved Jasper Reds. In contrast to many less fortunate semi-pro teams, money has not been an overly difficult task for the Reds. With the exception of a few lean years, area businesses have donated enough to cover most expenses. 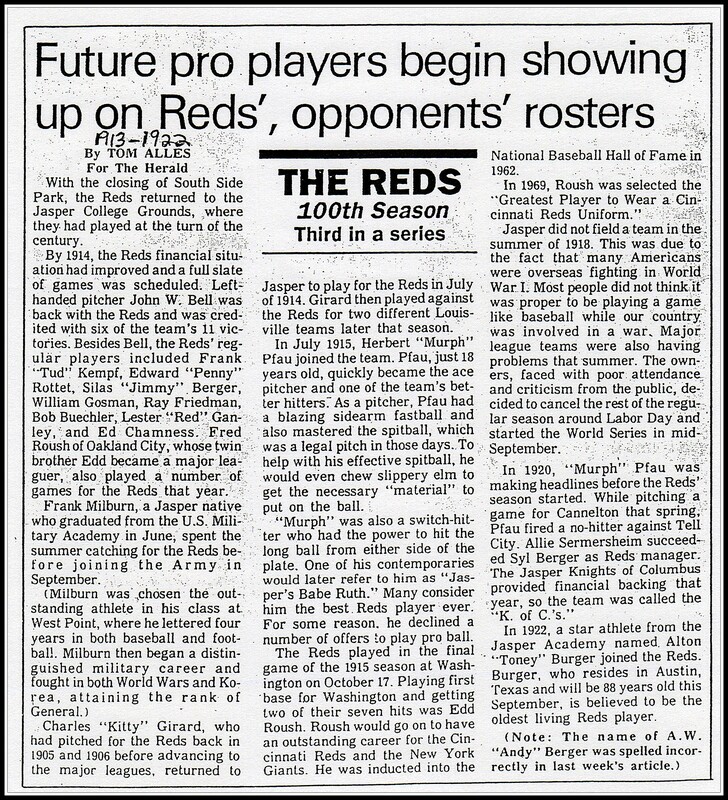 Team finances were given a major boost following the 1981 season when wealthy Jasper businessman, Alvin C. Ruxer, an avid fan of the Reds who once pitched for the team, set up two $10,000 trust funds for the team. The interest from certificates of deposit has helped significantly to defray season costs, such as new baseballs, umpire fees, etc. Several years ago, Jasper's Recreation Field was renamed in memory of the late Ruxer. To meet their budget needs, however, Alles and his players must each year solicit funds to keep intact a tradition that without strong support of Jasper citizens and businesses would have faded away like so many teams. And nobody seems to want to see the team die. The team does it by selling season passes, raffle tickets and a few donations here and there. As semi-pro clubs have done for so many years, the names of merchants in this German-flavored town have bought uniforms emblazoned with names - "KREMPP LUMBER", "STERNBERG FURNITURE/TV", etc. Kimball International, for over 20 straight years, has bought the team's insurance. The Reds still have to depend on their gate receipts to help carry the load. Unfortunately, it does not bring in a large amount of income, but helps pay for equipment, long distance phone calls and the cost of umpires. "During the 50s and 60s, crowds as large as a thousand fans were at the game," said Alles, "because there wasn't anything else to do. Now, many more big league games are being televised, softball has grown in popularity, and many other recreational sports occupy the time of people." "But we don't get discouraged because we love to play," said the hefty, sunny-faced manager of the Reds. "As long as you have that feeling, it doesn't matter if there are five or 5,000 people in the stands. That's what has made hometown baseball. There must always be a local semi-pro team, not just for the fans but for the young men who want to play baseball." Alles exemplifies the underlying spirit and longtime tradition of semi-pro baseball, although not as successful as those managers who distinguished themselves with championships in the NBC World Series, such as Bauldie Moschetti and Bob Sullivan. Recognition of Alles and the "100th Anniversary of the Jasper Reds" was based on intangibles and achievements other than trips to Wichita. 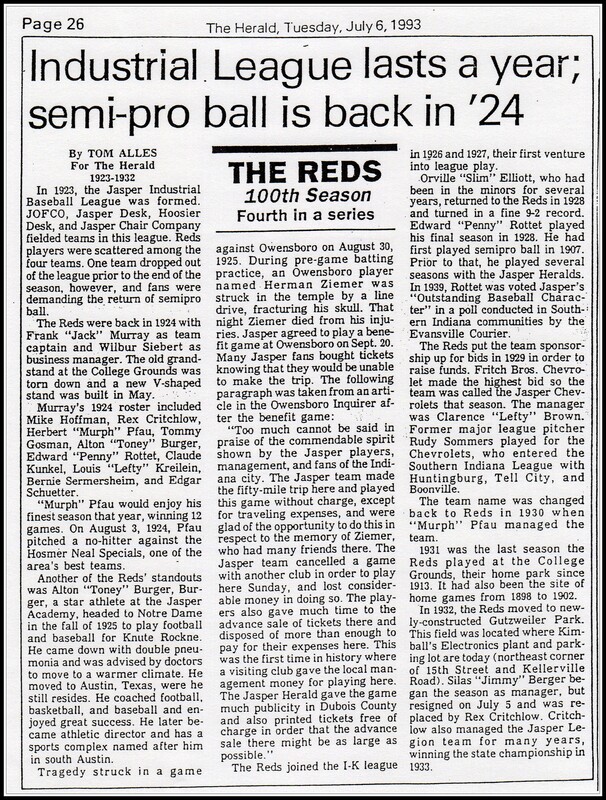 The Reds were invited only once to the NBC classic, in 1993, the year Jasper celebrated their anniversary. Back in 1974, when Jasper's team was about to fold, Alles, then a young college sophomore, took on what would have been a most difficult task for even the most seasoned manager. And he came through like a true veteran. He led his teams to numerous winning season, then after 21 years as manager, he retired in 1993, only to be asked again to return in 1996. For nearly a quarter of a century, Alles has served with much distinction as the Reds' field manager, in addition to handling the club's business affairs, the often times frustrating financial deficits, concerns about crowd support, travel problems and fielding a competitive team. Still in his 25 years as a manager, his teams have won over 400 games. In all of his years of managing, he missed just three games. The Reds, by the way, lost all three! He buys the equipment, makes up the schedule, finds the players and orders their uniforms, hires the umpires, and keeps a close eye on the checkbook. Alles has had to beg for money to pay for uniforms. He has seen his team's treasury dip below $3.00, knowing full well there will not be more than 50 people in the stand when his team plays its next game. Occasionally, he has had to coax players to come out to play or hold off their vacation until the season is over. On the field, Alles has the responsibility to make decisions of strategy that can advance the runner, shifting the outfield over to right, and executing the double steal. As for team rules, he has only two, "One that the guys can't play softball during the season, and the other, they have to tell me if they can't come to a game. I'm not a strict disciplinarian. My players have had enough coaches getting on them. Sure, we have some beer after the game, but we're very serious while on the field. Come in to our dugout and you'll see fire in guys' eyes." Alles talked about team spirit and dedication. "We have players who will go to a place like Danville, Illinois in the middle of the week. They know they won't get back until 2 o'clock in the morning and have to go to work the next day. Spirit like that means more to me than winning or losing a game. As for the formation of the team roster, Alles explained one of the things he always has done. "If someone plays with us one year and is real faithful to the team, I'll write his name down the next year. Sure, there have been times when I could find better players, but I think, there's something to be said for loyalty. When our team went to Wichita, I had people tell me, 'Load up!' But we just don't do it. According to the rules, a team is allowed to pick up players. I don't care if we get beat 50 to nothing, these guys played for me all summer, and I want them to play in the NBC World Series. We had a camaraderie that the other teams did not have. Players on other teams didn't know some of their teammates. One player told me, I don't know him. He just joined the team." The Jasper Reds has been Bob Alles' life, with strong support from his wife, Brenda. The team has also been the life of his three brothers, Bill, Tom and Jerry, whose father, Jerome "Chick" Alles, played for the Reds over a distinguished 15-year span. Indeed, this is the kind of dedication and commitment that has made semi-pro and hometown baseball so essential to a community.